The PC925LMJ (MJ=Metal Jacket), means the battery is housed in a metal jacket. This enables the battery withstand higher ambient temperatures. The PC925LMJ is rated to withstand temperatures of 176 degrees Fahrenheit vs. the standard PC925L is rated at 140 degrees Fahrenheit..*BatteryStuff understands the importance of getting a replacement battery right away and usually ships all batteries the same day as ordered if recieved before 1:30pm(pacific), however USPS does not guarantee delivery times with priority mail. Odyssey is the best battery you can buy, offering the most cranking power available of any battery its size, a whopping 900 amps for 5 seconds when fully charged. The physical case size of the PC925LMJ was designed for military applications and may not be a perfect fit for your application as it is sometimes a bit smaller, albeit but more powerful, than the original battery. In some applications minor cable modifications may be required. Do you own the PC925LMJ? Please, tell us what you think about it. It helps us provide you with better products. Please note that it may take up to 72 hours for your review to appear. Pros: I MADE A MISTAKE "I" WROTE A REVIEW ON A MOTORCYCLE BATTERY.MY INTENT WAS THE PC1200 ODYSSEY 12V 550CCA PERF.AUTOMOTIVE AGM BATTERY THAT WILL REPLACE MY TIRED DIEHARD DEEP CYCLE,THAT MSD SAY'S IT'S CHARECTERISTICS IS THE SAME GROUP.IT IS COMPATABLE! Cons: IT HAS THE DESIRABLE POST I PREFER.SO I'LL JUST HAVE TO WAITE TILL I GET ENOUGH MONEY OR SUBMIT A PROPOSAL FOR SPONSORSHIP. 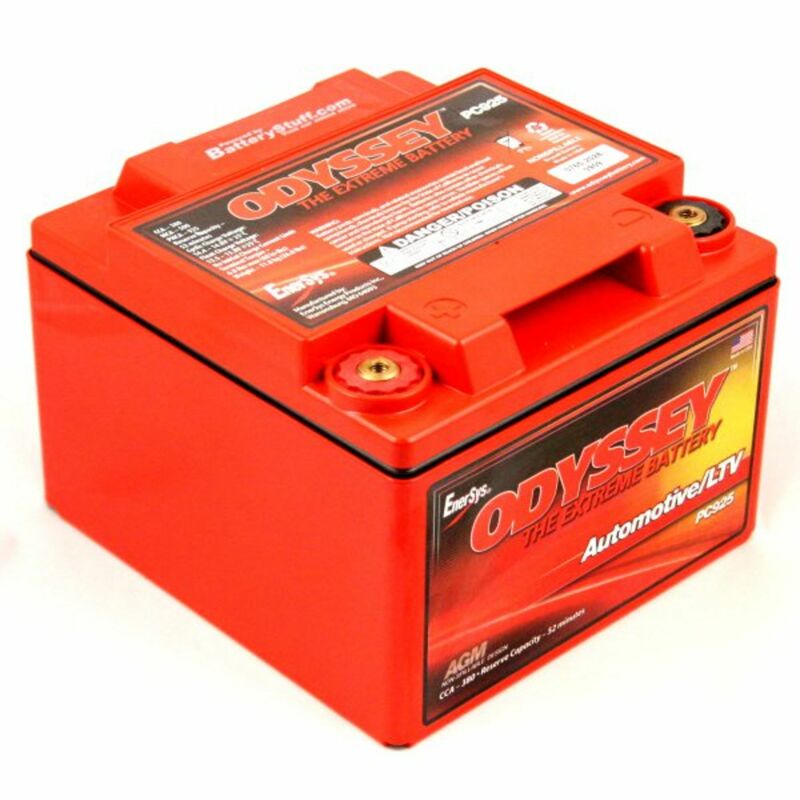 AS OPOSSED TO THE PC1200 ODYSSEY12V 550CCA PERF.AUTOMOTIVE AGM BATTERY. Cons: THE ONLY DETAIL I'VE IDENTIFIED,IS I PREFER THE TOP POST SO I'LL NEED TO GET THE ADAPTERS NO BIG DEAL! 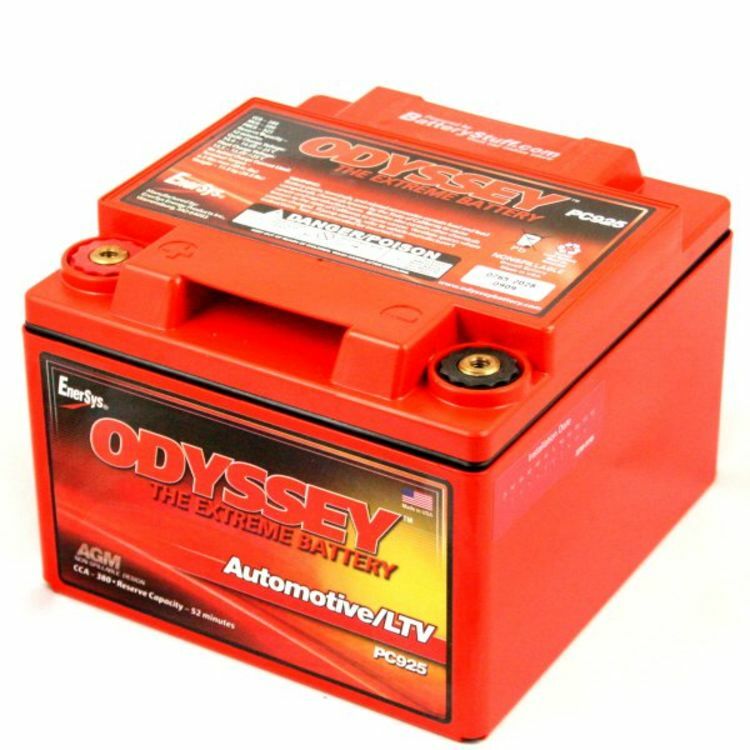 Pros: This is my second Odyssey motorcycle battery. My first one I used in two of my Harley Davidson motorcycles over 300,000 miles and 11 years between the two of them. The only reason I ordered the battery I got, was that I forgot to take out the battery when I sold my Harley for a new one. So I had to get another one and the price was lower than the first one I bought in 1997. Cons: Not a single Con that I can think of. As a Motorcycle safety Instructor, I had to rely on my Harley touring bike starting every time. During a class the battery had to start the bike as many as 20 or 30 times in a two day class. It seems to be a batter for a lifetime on most bikes. Pros: I researched this type of battery, gell vs wet and found you can't beat gell for reliability. I picked this battery because it is simply the best. It has a deep cycle feature that not only allow you to run the radio for hrs but cold or hot ambient temerature the bike jumps to life. I also reccomend you get a battery desulfator. I got one from this co. too. Pros: I swear by these battery. Has not let me down yet in a few years. Cons: Pay it not, pay it later. 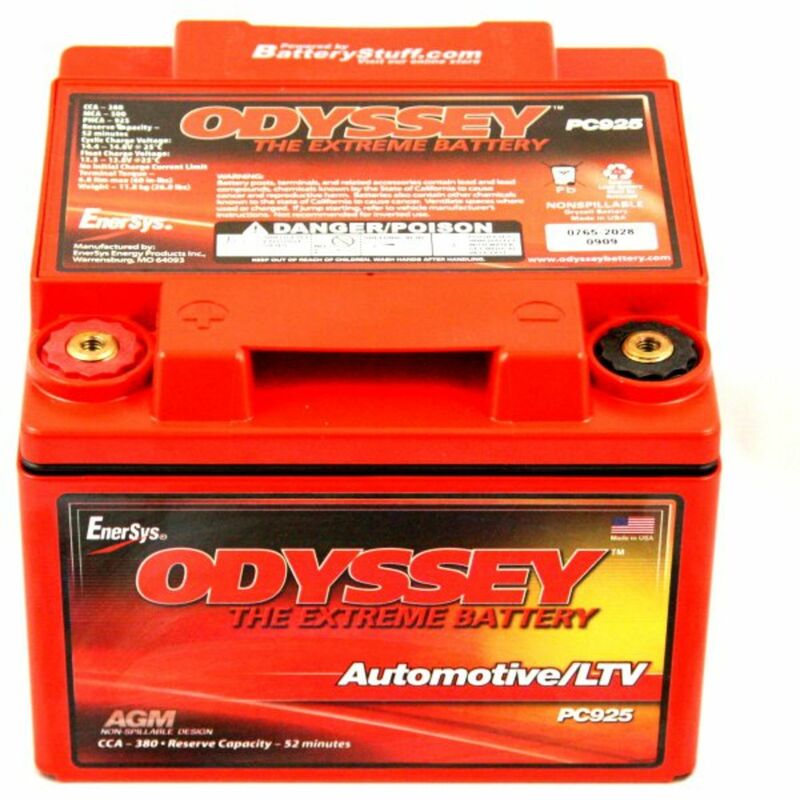 I bought my first Odyssey (Drycell) batteries in 2008 that my original Harley Davidson battery went bad on my 2007 Ultra Classic. An electrician friend of mine told me about this brand and recommended it to try it out. In 2013 I bought my Wife a Harley Davidson Street Glide about a year later the battery went bad and I bough our second Odyssey battery, since my 2007 Ultra Classic was still running strong. In 2014 I traded in my 2007 with the Odyssey battery still cranking strong for a 2013 Ultra Limited about a year later the battery went weak and I bought my third Odyssey. It is July 2017 and both bikes are running with the Odyssey batteries with no problems. I always tell all my Dale Crew, Get an Odyssey!! !